The photo above is the view from my back porch. Do you see how the sun casts sort of a glow over the deck? Or is that just me? I took the photo this morning. Our house faces east, so the back porch is still cool from the night air as the sun is rising on the other side, and under the gazebo there is a nice breeze. 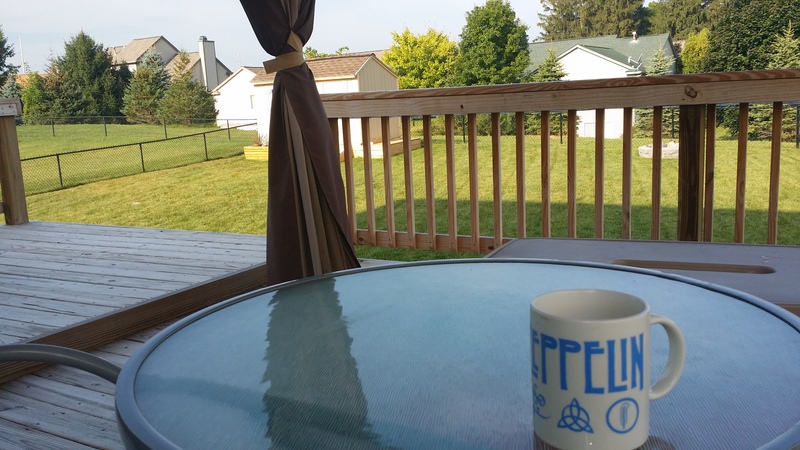 So this is where I have come to love sitting in the morning (granted, it’s only Day Two), with my coffee and Bible, while Piper runs around the yard or rolls in the grass. When she’s done with that nonsense, she comes and lies down at my feet. It’s lovely. Just lovely. We are so blessed with this new home. And if that wasn’t enough, we have some really awesome neighbors. All of them. Really. They even have a private Facebook page they use to keep in touch with each other. So while we’ve done some chatting with them leading up to the day we moved in, today we actually got to meet several of them. In fact, when people started getting home from their respective jobs, they seemed anxious to meet us and say hello. The woman from across the street walked over to say hi, and we discovered we both have sons named Luke. A lady from the end of the street stopped at our driveway as she was leaving the neighborhood, and I was able to meet her and her son (whom I found had already met Luke yesterday). Then after Mike came home we met the man who lives next door to us, as well as his wife and two kids. It’s amazing how friendly these people are. We had heard this was a great neighborhood, but now we’re experiencing it and finding it to be absolutely true. Oh, and get this – there are at least three other couples on the block whose first names start with the same letter, just as mine and Mike’s do (Mike and Mindy). There are the S’s next door, the D’s across the street, and another set of M’s further down. I love alliteration, I really do. What can I say? I’m a geek, all the way. The unpacking is moving along. Throughout each day there is a constant feeling that I’m about to hit a wall, but I haven’t actually done it yet. I figure if I just go slow, then even if I do hit that wall, I won’t break anything. Just in theory, of course. I am developing some killer calf muscles, going up and down the stairs. But overall, life is good here and we feel pretty well settled. We have internet now, toilet paper, milk. You know, the necessities. And here is where my brain is shutting down for the night, whether I like it or not. Good night! Well, I never did blog about those cookies, did I? Maybe next time. I have a lot on my mind this week. That was Monday, and I can’t remember what’s happened since. Mostly soccer games, doing laundry, walking to the bus stop, and a little eating and sleeping in between. I’ve been feeling like I have to stay “caught up” because I’m going to be out of commission for a bit. Why, you ask? Because tomorrow I am having surgery to get my 2nd cochlear implant installed, that’s why! And this time I’m pretty sure it’s for real. The UTI that prevented me from having surgery last month is gone, and I had the lab test done last week to be sure. So today is a day of making sure the floors are clean and the laundry is caught up and then I’ll be packing for tomorrow. Wish me luck, pray for me, send soft cookies, whatever! I’ll be back in due time. Just a bit of raw honesty here… Today I am feeling overwhelmed with the frustration of being unable to hear. Today I want my hearing back. Desperately. I want to just have a day, or even half of a day, where I am able to play on the Easy Level. Where it’s not so hard to sit and be with my kids, and have conversations with them. This is HARD, you know? Having said that, I feel a little better. The teary meltdown in the bathroom helped too. 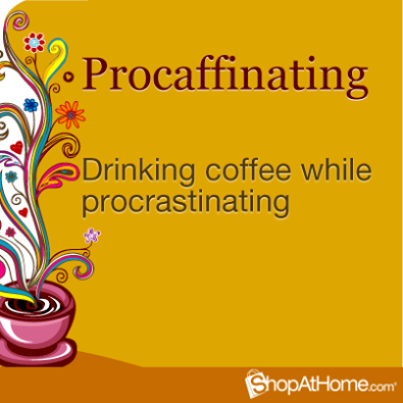 I think I will take my CI off for a bit and make another pot of coffee. This may sound trite, but today I am thankful for coffee. I have a small coffee maker, perfect for making my daily ration of two cups of coffee. And with a little half and half, my highly processed, cheap grocery store coffee goes down easy. Makes me smile. And since I just recently loaded my OliveTree app onto my new phone, I can read my morning scriptures in one hand while sipping from a piping hot mug of coffee with the other. And did you know? Running the pot and filter through the dishwasher before brewing really does make it taste better. No more lazy rinsing for this girl! What are you thankful for on this fine Friday?? I’ve been de-cluttering lately. Feels good to get rid of things. It’s good preparation for if we ever move to a new house. Which I hope we do, eventually. I finally went through the box of stuff that my former co-workers packed up for me when I lost my hearing and left work. That sounds like they were anxious for me to be gone, but really they were getting ready to move to a new building, so it had to be done. I found a lot of good stuff in there, pictures from when the kids were younger, my ipod and speakers, my notary stamp, even some herbal tea bags. I’m enjoying a cup of tea right now, of a flavor I had not tried before. I’m sure it was one a coworker gave me to try. Orange spice black tea. It’s actually quite yummy. As soon as the scent hit my nose it brought me back to my hippy days. And not the ones I spent stoned. It was after that, when I first moved to Lansing. I did hippy things (I suppose, not having lived during the true hippy era) like walking around the campus of MSU wearing sandals with fuzzy socks and long skirts, or drinking coffee at Bilbo’s until the wee hours, playing crazy silly songs on the jukebox (Cibo Matto, do you know your chicken?). I used to shop for tapes and CDs at the campus music store (two of which I found recently, but have no way to play, or listen to, really). I had a roommate who introduced me to house plants and egg noodles (the egg noodle craze lasting much longer than the plants, as I have a hard time keeping green things alive). I went to local concerts, camped out on lawns, and danced crazy dances. It was truly a carefree time for me, which I suppose is where the hippy reference fits best. I also did some pretty stupid things in those days, even after giving up smoking pot and drinking. I used to take off driving and get myself lost, just so I could find my way home again. When I lived downtown I very often walked around alone. On Independence Day I walked half a dozen blocks to sit on a hill to watch the fireworks. Alone. And this was 1997, so I had no cell phone. Then there was the time I considered buying a VW bus from a guy I met at the laundromat, so I took the bus for a test drive, with the stranger dude riding along. Not smart. Hmm. That train of thought took an unexpected turn. It’s good to remember happy times from the past, but I guess it’s also just as good to recognize some of the stupid things we’ve done, and be thankful we lived through them. God often keeps us safe despite ourselves, doesn’t he?